Made up of more than 700 islands, cays, and islets in the Atlantic Ocean, the Bahamas is indeed the land of plenty when it comes to idyllic ocean settings. However, only 14 of these Out Islands are inhabited. These include the blissful serenity of the Exumas, well known for stunningly tranquil beaches, world-class diving, and resorts that offer sanctuary from the hustle bustle of busy modern-day life. Great Exuma and Little Exuma are both majestic in their own right, and the gorgeous Exuma Cays offer a constellation of largely uninhabited areas surrounded by astonishing reefs in full bloom and lush wildlife. The Sea Park, founded as the world's first land-and-sea reserve in 1958, is also a worthy stop for those who love exploring the bounty of the sea. Said to have some of the bluest waters in the world, and lots of it, the Exumas are an incredible destination for travellers who enjoy boating, fishing, water-sports, and anything else that involves a beautiful ocean atmosphere. 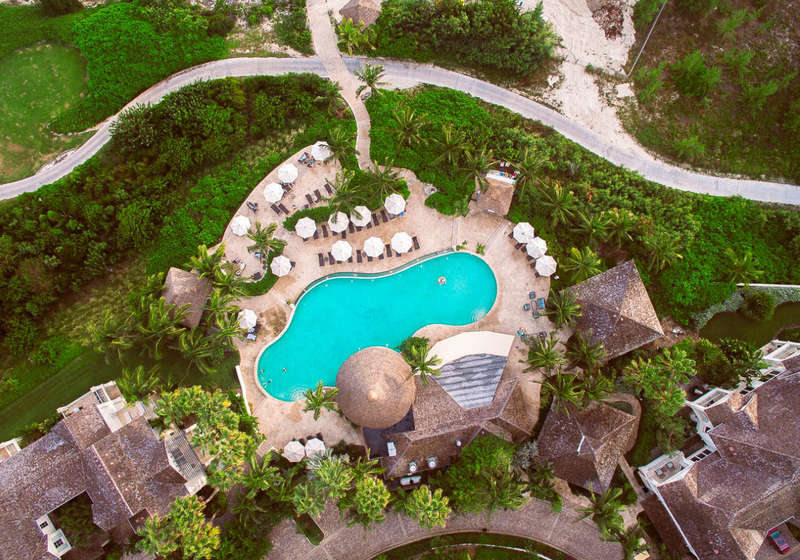 Many of the private islands are explicitly designed for those seeking a peaceful escape, while the luxury Exuma rentals available in both the Cays and Great Exuma are a draw for couples on romantic getaways, as well as families’ and friends’ vacations. Tropic of Cancer Beach, AKA Pelican Beach, is located on Little Exuma, just outside of Williams Town, and has been called one of the loveliest beaches in the Exumas, as well as being a snorkeler’s delight. The white sands of Coco Plum Beach are decorated with gorgeous palm trees. Although this family friendly beach is a great spot for a picnic, the beach bar is said to serve the best food on the island. Also well known for its incredible shells and sand dollars during low tide, Coco Plum is an ideal destination for those interested in collecting ocean memorabilia. Because of the incredibly high number of beaches worth visiting in the Bahamas, there are numerous ones that rarely have any visitors—perfect for those seeking peace and quiet. Imagine enjoying the luxury Exuma beach rentals on offer as well as an entire beach all to yourself? The majority of the Exumas are oval-shaped islands strung together in a 209 km (130-mile) chain. Saddle Cay is an exception worthy of a visit. Its horseshoe-shaped curve near the Exumas' northern tip can only be reached by boat, but once you arrive, you can expect an idyllic setting seemingly free of any trace of the modern world, as well as numerous other cays and islets to explore at your leisure. Stocking Island features spectacular views from its high bluff and a set of idyllic beaches separated by limestone jetties. But some say there is no better way to experience the Exumas than island hopping with a Bahamas Air Tour. The breathtaking views are enough to make anyone fall in love. While most people explore the islands from the ground and sea, seeing the chain of Out Islands from up above is an unparalleled experience. 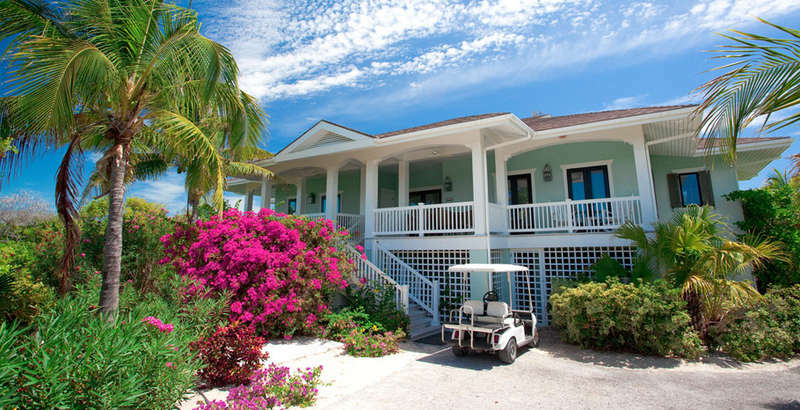 When the exploring is done, retreat to your stunning Exuma Bahamas villas. What better way to end the day? While the beaches and islands are spectacular, the real beauty of the Exumas is the deep blue water itself. Do plan at least one boat excursion during your getaway. The chance to sail through turquoise clear water among gorgeous reef-adorned cays is simply magical. The Exumas are largely “untouched,” and offer spectacular snorkelling and scuba diving opportunities. Charter a boat for the day to visit the sites, and stop along the way to get some diving in. If you are staying in Exuma rentals in the Great Exuma region, Elvis’ Water Taxis at the government dock will take you out snorkelling around the nearby islands. The most frequented destination in the Exumas is Great Exuma, which happens to be where the laidback capital of Georgetown is located. 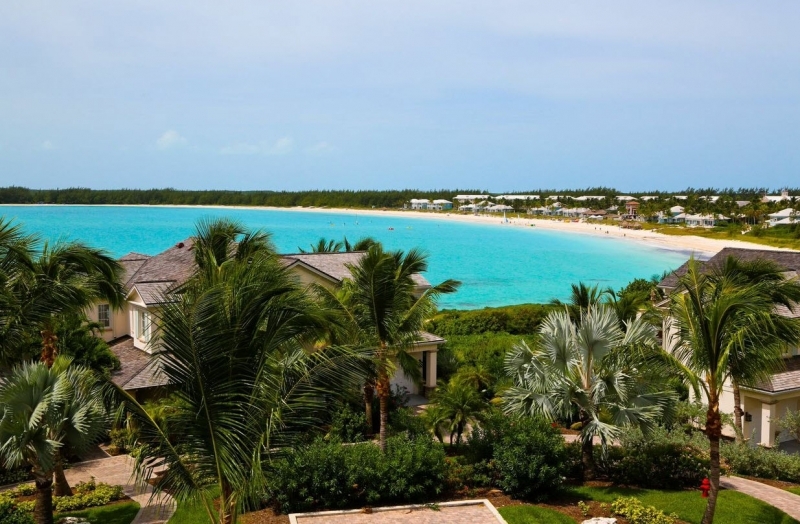 Great Exuma is also the largest island in the Bahamas. The beaches in this region are stunning, and there is no shortage of dining options in the area either. Staniel Cay is a popular alternative however, and is considered the gateway to boating in the Exumas. Although it is much smaller and more idyllic, you will need a rental car to get around. Contact Rental Escapes to take your trip to the next level and arrange for a private chauffeur. We would be happy to accommodate your needs. 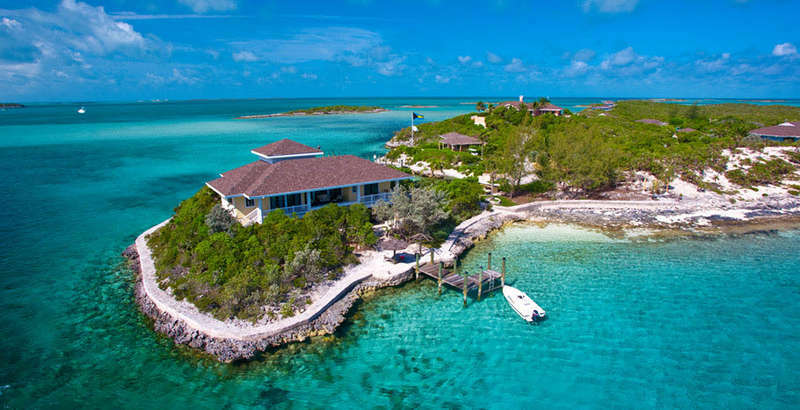 Staniel Cay is also more centrally located, and closer to popular attractions like the mile-long sand bar, the nurse sharks on Compass Cay, Thunderball Grotto, and the world-famous swimming pigs of Exuma, of course. Enjoying your Bahamas vacation rental to the fullest means not missing out on swimming with these pigs! Some say the pigs were left on the island by sailors long ago as a back-up food source, while others say the pigs may have been aboard a ship that sank in the region. One thing is for sure: no trip to the Exumas is complete without paying a visit to these charming animals. The original swimming pigs are located on Farmer’s Cay, near Staniel Cay. Professional guides offer half-day and full-day tours. We are proud to offer our guests world-class vacation rentals, available with a full roster of services, including but not limited to drivers, housekeeping, personal shoppers, and in-house chefs to stock your kitchen and/or prepare mouthwatering local cuisine for you and your co-travellers to feast upon. Local dishes are generally rich in fresh seafood like fish, shellfish, lobster, crab, and conch, as well as tropical fruits, rice, peas, pigeon peas, potatoes, and pork. While there are a dozen or so great restaurants on Great and Little Exuma, availability is low and advanced reservations are needed. For a good time dining out, you can expect to discover the best food at local beach bars like Santana’s Grill Pit on Little Exuma, the poolside restaurant at the Grand Isle Resort, Tropical Breezes on Little Exuma, and the Chat ‘n’ Chill Sunday pig roasts on Stocking Island. The latter is practically on its own private island where there is plenty to do for the whole family, including a hike across the island to the Atlantic side, for example, or a magical swim with the stingrays. Many of the people who live in the Bahamas are of West African descent, while others are descendants of the English Puritans who immigrated to Bermuda and ended up settling on Eleuthera Island. The result is a fascinating multicultural mix of native West African traditions, English customs, and several other cultures who have been in the region for hundreds of years. These diverse cultures come together to shape what visitors experience as modern Bahamian culture. The beautiful and unique mingling of diverse people and customs in the Bahamas continually reminds visitors from near and far of the importance of celebration and community. Bahamian music stems from this sense of celebration. From Caribbean reggae to the rake ’n’ scrape with its hearty fusion of drum, accordion, and hand saw, all live music of the region is worth showing up for. Make a dance night of it before returning to your luxury house rental for a restful seaside sleep. The yearly Bahamian Music and Heritage Festival, usually held in March, is extremely popular in The Exumas, with tourists and locals alike. The cultural festival offers up the best of local food, art, and music to all who attend. With lots of activities for kids and adults including storytelling, singing, poetry reading, how-to demonstrations, as well as contests involving sugar cane peeling, onion peeling, and conch cracking, there is something for everyone. Browse our top-tier selection of vacation rentals to ensure your upcoming trip coincides with the Festival. George Town is your best bet for shopping. The Straw Market is a great place to acquire locally made gifts and merchandise. And do not miss the Sandpiper Arts and Craft Boutique, a unique Bahamian one-stop shopping destination. Their selection of authentic Bahamian items reflects a true richness of heritage and a bonafide love of island life. Their gallery features three generations of one-of-a-kind collectable pottery very much worth checking out. Choosing to rent a luxury vacation home in the Exumas is the first step. The main airport in the Exumas, Exuma International Airport (GGT), is located on Great Exuma. Several major national and international airlines offer daily, bi-weekly and weekly flights to the islands as well. Regular chartered flights can be arranged from Staniel Cay Airport (MYES), Black Point Airport (MYEB), and Farmer’s Cay Airport, or through any other certified carrier. By sea, you can travel from Nassau with the Bahamas Ferry Services on a fully air-conditioned vessel, or aboard a mailboat that makes stops at numerous towns on a regular basis. 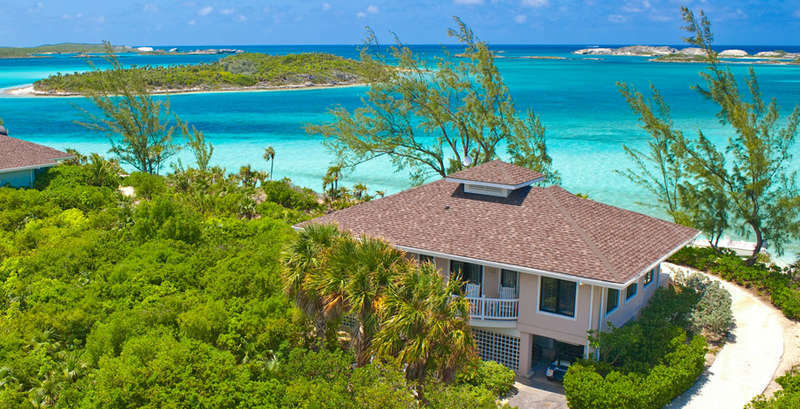 Rental Escapes is proud to offer a wide selection of luxury vacation rentals in the Exumas, and we would be delighted to help arrange any and all unique travel logistics to make your stay that much more relaxing. We can help you to create and customize your experience in other ways too. From booking the right Exuma vacation rental for your needs, to organizing special events or personalized tours, our experts will help you get fully set up. Your job is simple: browse our places to stay, choose the one for you, pack a bag, and savour the view from your luxury villa in the Bahamas.